Help your local songbird population thrive by providing them shelter with this Bird In Hand Wellsville Wren House. The classic shape and aged red hue on this home lend a timeless look to your garden, while reducing landfill waste for an environmentally sound hint. A diamond shaped front and back panel create the conventional shape, topped by a significant, pitched metal roof. An extended wooden plank creates a base, allowing you to rest this home on a level surface, and also provides perching area for small songbirds. The 1.125" diameter, front opening allows wrens or chickadees to enter the piece, and the metal roof fully covers the item, keeping the nest chamber dry. Any captured water drains via a hole on the base of the shelter, and a 2" diameter opening on the back allows for seasonal cleanouts. A metal panel covers this opening while the home is in use, keeping birds protected. Hang the roost from a hook or branch using the attached metal loop. Its aged red and gray color scheme enhances the rustic feel, while its reclaimed wood construction creates a one-of-a-kind piece. 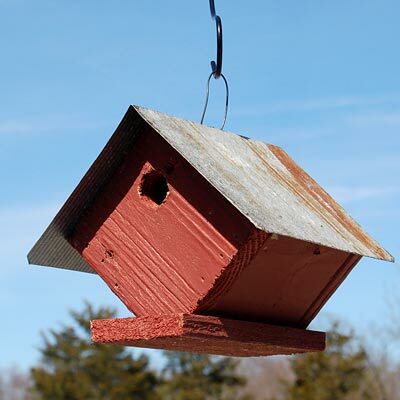 Provide small songbirds a fantastic home with this Wellsville Wren House. Made in the USA. Note: This product is handcrafted by the Amish using reclaimed and recycled wood. As such, each individual item may vary slightly. Droll Yankees Standard Hook, Gray, 28"